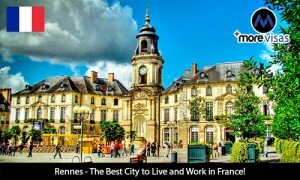 Home » France Immigration » Rennes – The Best City to Live and Work in France! When you ask people about the best places to live in France, they just name Paris, Lyon and Bordeaux. However, a new report reveals that the Breton region of Rennes stands as the top destination. It is considered as the best city for foreigners who look for quality lifestyle. Rennes has a better environment compared to any other city, with affordable accommodation, transport, nightlife and better prospects of employment. Nantes secured second place because of its green spaces, low rents and international flights. The city Bordeaux followed Nantes and scored high for better air links. Rennes is well known for international students, which has the population of 200, 000 and is voted as the best city to live in France. This city has better transport connections; it takes just 90 minutes to reach Paris! The ongoing Metro works will make it easier to travel to the ‘City of Lights’. Foreign nationals prefer moving to Rennes, because of the quality of life you get there. French people are liberal and they are welcoming towards immigrants. The study also reveals that Rennes has a very low unemployment rate compared to 13 other cities of France. There are numerous visa options to individuals who wish to migrate to France’s beautiful city of Rennes. ← Need Better Prospects? Migrate to Canada!